The rich are generally considered to be somber, strictly guarding their privacy and loath to mingle with strangers. However, this typical image does not seem to fit the profile of the youngest daughters of Korea’s top business tycoons. They seem to be manifesting surprisingly different and unexpected personalities compared to their older siblings, who are usually more traditional and reserved, burdened with the responsibility of carrying forward the family business. The next-generation women are building their own personas by appearing to be more free-spirited and people-friendly, and also by doing business in unconventional ways. The Korea Herald Investigative Team did some background research on the youngest daughters of conglomerate families and checked how their lives are unfolding. Lee Seo-hyun, the younger daughter of Samsung Electronics chairman Lee Kun-hee, has walked a different path ever since she was a student. The fashion division president of Cheil Industries has charted a course different from that of her older brother and sister. While her siblings went to universities in Korea to study Oriental history and child welfare, she is a graduate of the renowned Parsons School of Design in New York. Lee is currently in charge of Samsung’s fashion and advertisement businesses, fields in which she is able to put her talents to use. She has led the company’s growth since she joined Cheil Industries’ fashion division in 2002, and last year was made president. She has worked on expanding the fashion business, and is the driving force behind Cheil Industries decision to alter its identity from a luxury suit-maker to a more affordable and trendy brand. Since she took the helm, the company has become associated with affordable specialty store retailers, private labels, apparel brands and even an exclusive new brand with YG Entertainment. A similar pattern has unfolded at KwangJuYo Group, a maker of traditional Korean pottery. Cho Hee-kyung, the younger daughter of KwangJuYo chairman Cho Tae-kwon, currently leads her father’s Korean cuisine business. Having studied design in the U.S., she went on to do a food course in Italy and built her career as a chef. Her father appears to have solid trust in her talents, which is why he has entrusted her with the management of Bicena, a high-end restaurant chain, industry watchers said. While both the aforementioned women have chosen to join their family business, some have decided to live a totally different life. Korean Air executive vice president Cho Hyun-min publishes a children’s book. Cho first made headlines when she started out in 2005 as a low-level clerk at the then-LG Ad, an advertisement agency that has now been renamed HS Ad. After two years, she transferred to Korean Air, where she made an appearance in the company’s TV commercial, as a girl doing a bungee jump no less. She also took training with the newly employed cabin crew at Jin Air, a budget carrier owned by Korean Air, and helped with the in-flight services. As an e-sports enthusiast, she is often referred to as the “goddess of e-sports.” In 2013, she established an e-sports team through Jin Air called Jin Air Greenwings and is often found watching the games on-site. When her team wins a competition, she has one of the planes in the fleet decorated with photos of them as a way of showing support. She has just become an author, having publishing a children’s travel book series titled “Jini’s Dazzling World Adventure,” the story of a 12-year-old girl who travels around the world alone to experience different cultures and to make friends in different cities. More recently, she has appeared on a TV talk show to talk about her life and her family. “I think I became independent by trying to catch up with my siblings, who are much older than me and more experienced,” Cho said. Another free-spirited tycoon offspring is Koo Yeon-su, the younger daughter of LG Group chairman Koo Bon-moo, who is still a high school student. She was born late in Koo’s life ― he was 51 at the time ― and seems to be disinterested in the family business. Currently, she is pursuing her dream of becoming a painter. 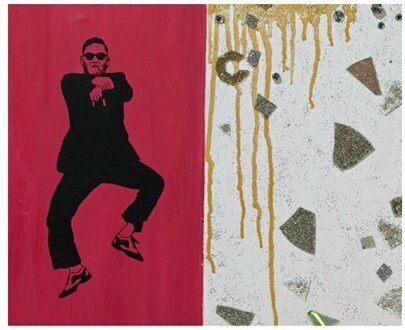 In 2013, she took part in a mother-daughter exhibition at an art museum in Insa-dong, Seoul, presenting still life and figural paintings including one of the popular Korean singer Psy. Chey Min-jung, the daughter of SK Group chairman Chey Tae-won, garnered public attention when she decided to join the Korea Naval Academy to become an officer. However, this was not the first time she made a decision that was unusual for the offspring of such a powerful business tycoon. Unlike some children who tend to regard their parents as their own personal banks, the junior Chey is known to have been financially independent from the start, having worked part-time jobs during vacations when she was studying at Peking University in Beijing. Chey Min-jung, daughter of SK Group chairman Chey Tae-won, fires a handgun during training at the Korea Naval Academy. Studying abroad from a young age apparently helped her develop this sense of independence, according to people close to Chey. In the process, she has gained social experiences in areas that are quite irrelevant to her family business. In 2013, she and a group of acquaintances cofounded Pandakorea.com, a Chinese online shopping mall where consumers can directly purchase Korean products. She quit the business when she applied to the Naval Academy. Her decision to join the defense services was inspired by her maternal grandfather Roh Tae-woo, a former Korean president who was also a soldier. The fact that the daughter, and not the son, decided to volunteer for military service instead of opting for the so-called “easy life” is being seen as an exemplary case of noblesse oblige.